The city of Burbank has established a voluntary program for the retrofit of existing wood frame residential buildings with soft, weak, or open front walls. The Burbank Municipal Code Title 9, Chapter 1, Article 7, Division 4 requires that Chapter A4 of the 2012 International Existing Building Code (IEBC) be followed as part of this voluntary effort. The list was compiled from permits records and a visual inspection from the street. The properties permitted prior to 1978 were place into three groups based on number of units. Properties permitted after 1978 are not subject to this proposed ordinance. The city of Burbank established this ordinance with compliance on a voluntary basis. Therefore, there are no deadlines for conformance. However, it is recommended that the provisions outlined in the municipal code be followed on a timely basis to promote public welfare and safety by reducing earthquake-related damage of buildings of wood-frame soft-story construction. What is a soft-story or weak front building? A soft story building is one with soft, weak or open-front walls on one or more side of the first story. These buildings typically have tuck-under parking and storage with one story of apartment units above or they have a wall that has mostly door or window openings with very a low percentage of structural wall framing in between. What buildings will be affected by the proposed ordinance? A weak front first story with two or more stories above. Why are the buildings separated by the year 1978? California Assembly Bill 304, passed in 2005, encourages Cities to implement a mandatory seismic retrofit of soft story buildings constructed or permitted prior to 1978 when the Building Code changed because of the San Fernando earthquake in 1991. How was the list of affected properties compiled and organized? The list was compiled from permits records and a visual inspection from the street. The properties permitted prior to 1978 were place into three groups based on number of units. Group I is comprised of buildings with 10 or more units, Group II is 5 to 9 units and Group III is 3 to 4 units. The properties permitted after 1978 are not subject to this proposed ordinance. 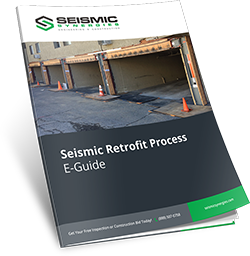 Click the link below to read Burbank’s Seismic Retrofit Program Municipal Code in its entirety. The City of Burbank is within California Building Code Seismic Zone 4. This is the highest risk for damaging earthquakes. Approximately 30 percent of the City is categorized as an “Active Fault Near-Source Zone” (ICBO, California Department of Conservation-Division of Mines and Geology). The Near-Source Zone is an area within two kilometers of an active fault (Class A or B) capable of producing a major earthquake. The Verdugo Fault and the Hollywood Fault are the near-source influences for the City (both are Class B faults). A Near-Source Zone is subject to the largest and most damaging ground acceleration and velocity produced in a seismic event. The resulting structural damage in a near-source zone is generally severe. The 1994 Northridge Earthquake caused considerable damage to buildings and structures located in the City of Burbank. Experts expect a massive earthquake on one of the faults under the City within the next 30 years and several earthquakes similar in intensity to the Northridge Earthquake during that same period. The damage to buildings could expose occupants of these buildings to a potential life-safety risk in future earthquakes, and the City of Burbank must protect its population and property and enforce the Building Code so as to provide effective protection to all its citizens. Recent earthquakes, including the 1994 Northridge event, have demonstrated the deficiencies in the structural performance of reinforced concrete wall and/or reinforced masonry wall buildings with flexible diaphragms. The 1997 California Building Code contained revisions to the seismic requirements for new construction, but it did not address the existing “legal nonconforming” buildings. Pre-1976 UBC reinforced concrete wall and/or reinforced masonry wall buildings with flexible diaphragms are considered potentially hazardous and prone to significant damage, including possible roof collapse, in moderate to major earthquakes. These buildings may lack adequate strength in the anchorage system of the wall to the roof and floor diaphragms. The purpose of this section is to promote public safety and welfare by reducing the risk of death or injury that may result from the effects of earthquakes on reinforced concrete wall and/or reinforced masonry wall buildings with flexible diaphragms designed under the building codes in effect prior to the adoption of the 1976 UBC. Such buildings have been categorized, based on past earthquakes, as being potentially hazardous and prone to significant damage, including possible collapse, in a moderate to major earthquake. The provisions of this section are minimum standards for structural seismic resistance established primarily to reduce the risk of life loss or injury on both subject and adjacent properties and will not necessarily prevent loss of life or injury or prevent earthquake damage to an existing building which complies with these standards. The requirement for compliance with these standards does not preclude the utilization, at the building owner’s option, of more extensive strengthening method that might further prevent or limit loss of life or injury or building damage. This section shall not require existing electrical, plumbing, mechanical or fire-safety systems to be altered unless they constitute a hazard to life or property. The provisions of this section shall apply to all buildings designed under building codes in effect prior to February 14, 1977, which, on the effective date of this section have reinforced concrete walls and/or reinforced masonry walls with flexible diaphragms as defined herein. ANCHORAGE SYSTEM: Is the system of all structural elements and connections which support the concrete or masonry wall in the lateral direction, including diaphragms and sub-diaphragms, wall anchorage and continuity or cross tie connectors in sub-diaphragms and main diaphragms. COMMENCED CONSTRUCTION: Construction pursuant to a valid building permit has progressed to the point that one of the called inspections as required by the City has been made and the work for which the inspection has been called has been judged by the City to be substantial and has been approved by the Building Official. FLEXIBLE DIAPHRAGM: Is any diaphragm constructed of wood structural panel, diagonal or straight wood sheathing, metal decking without a structural concrete topping, or horizontal rod bracing. REINFORCED CONCRETE WALL: Is a concrete wall that has 50 percent or more of the reinforcing steel required for reinforced concrete in the Uniform Building Code. REINFORCED MASONRY WALL: Is a masonry wall that has 50 percent or more of the reinforcing steel required by 1976 Uniform Building Code Section 2106.1.12.4. 2. A structural analysis and plans for the proposed structural alterations of the building necessary to comply with the minimum requirements of this Section, or (3) Plans for the demolition of the building. After plans are submitted and approved by the Building Official, the owner shall obtain a building permit, commence and complete the required construction or demolition within the time limits set forth in Table No. 9-1-7-200-B. These time limits shall begin to run from the date the compliance order is served. A. The Building Official shall issue a written compliance order to the record owner of each building within the scope of this Section 9-1-7-200 directing the owner to comply with this section and shall also mail a copy to the person, if any, occupying or otherwise in real or apparent charge and control of the building. 1. The street address and legal description sufficient for identification of the building. 2. A statement that the Building Official has found the building to be within the scope of Section 9-1-7-200. 3. An order to prepare and submit to the Building Official a structural analysis and plans pursuant to Section 9-1-7-200.5. 4. A statement specifying the appeal rights of the owner as contained in Section 9-1-7-200.7. A. The owner of the building may appeal the Building Official’s determination that the building is within the scope of this section to the Board of Building and Fire Code Appeals. Such appeal shall be filed with the Board within 60 days of the service date of the order described in Section 9-1-7-200.6. Such appeal shall be made in writing upon appropriate forms provided therefore by the Building Division, and the grounds thereof shall be stated clearly and concisely. Any materials that the appellant wishes considered by the Board shall be submitted to the Board at least 14 calendar days before the hearing. Each appeal shall be accompanied by a filing fee as set forth in the Burbank Fee Resolution. If no appeal is filed within 60 days of the service of the compliance order, the building shall be considered to be within the scope of this Section 9-1-7-200. Concrete and masonry walls shall be anchored to all floors and roofs which provide lateral support for the wall. The anchorage shall provide a positive direct connection between the wall and floor or roof construction capable of resisting a horizontal force equal to 30 percent of the tributary wall weight for all buildings, and 45 percent of the tributary wall weight for essential buildings, or a minimum force of 250 pounds per linear foot of wall, whichever is greater. The required anchorage shall be based on the tributary wall panel assuming simple supports at floors and roof. The steel elements of the wall anchorage systems and continuity ties shall be designed by the allowable stress design method using a load factor of 1.7. The 1/3 stress increase permitted by 1976 UBC Section 1603.5 shall not be permitted for materials using allowable stress design methods. The strength design specified in 1994 UBC Section 1925.2, using a load factor of 2.0 in lieu of 1.4 for earthquake loading, shall be used for design of embedments in concrete. Wall anchors shall be provided to resist out-of-plane forces, independent of existing shear anchors. EXCEPTION: Existing cast-in-place shear anchors may be used as wall anchors if the tie element can be readily attached to the anchors and if the engineer or architect can establish tension values for the existing anchors through the use of approved as-built plans or testing, and through analysis showing that the bolts are capable of resisting the total shear load while being acted upon by the maximum tension force due to earthquake. Criteria for analysis and testing shall be determined by the Building Division. Development of anchor loads into roof and floor diaphragms shall comply with 1994 UBC Section 1631.2.9.3. EXCEPTION: If continuously tied girders are present, then the maximum spacing of the continuity ties is the greater of the girder spacing or 24 feet. In wood diaphragms, anchorage shall not be accomplished by use of toe nails or nails subject to withdrawal, nor shall wood ledgers, top plates or framing be used in cross-grain bending or cross-grain tension. The continuous ties required by 1976 UBC Section 1633.2.9.4 shall be in addition to the diaphragm sheathing. At reentrant corners, continuity collectors may be required for existing return walls not designed as shear walls, to develop into the diaphragm a force equal to the lesser of the rocking or shear capacity of the return wall, to the tributary shear by not exceeding the capacity of the diaphragm. Shear anchors for the return shall be commensurate with the collector force. If a truss or beam other than rafters or purlins is supported by the return wall or by a column integral with the return wall, an independent secondary column is required to support the roof or floor members whenever rocking of shear capacity of the return wall is governing. Anchorage of pilasters shall be designed for the tributary wall anchoring load pursuant to Section 9-1-7-200.11.1, considering the wall as a two-way slab. The pilasters or the walls immediately adjacent to the pilasters shall be anchored directly to the roof framing such that the existing vertical anchor bolts at the top of the pilasters are by-passed without causing tension or shear failure at the top of the pilasters. EXCEPTION: If existing vertical anchor bolts at the top of the pilasters are used for the anchorage, then additional exterior confinement shall be provided. Existing mezzanines relying on the tilt-up walls for vertical and/or lateral support shall be anchored to the walls for the tributary mezzanine load. Walls depending on the mezzanine for lateral support shall be anchored per Sections 9-1-7-200.11.1, 9-1-7-200.11.2 and 9-1-7-200.11.3. A. Floor plans and roof plans shall show existing framing construction, diaphragm construction, proposed wall anchors, cross-ties and collectors. Existing nailing, anchors, ties and collectors shall also be shown on the plans if these are part of the design, and these structural elements need to be verified in the field. B. At elevations where there are alterations or damage, details shall show roof and floor heights, dimensions of openings, location and extent of existing damage, and proposed repair. C. Typical wall panel sections with panel thickness, height, location of anchors shall be provided. D. Details shall include existing and new anchors and the method of development of anchor forces into the diaphragm framing; existing and/or new cross-ties; existing and/or new or improved support of roof and floor girders at pilasters or walls. The City of Burbank is within CBC Seismic Zone 4. This zone is the highest risk for damaging earthquakes. Approximately 30 percent of the City is categorized as an “Active Fault Near Source Zone” (ICBO, California Department of Conservation-Division of Mines and Geology). The Near-Source Zone is an area within two kilometers of an active fault (Class A or B) capable of producing a major earthquake. The Verdugo Fault and the Hollywood Fault are the near-source influences for the City (both are Class B faults). A Near-Source Zone is subject to the largest and most damaging ground acceleration and velocity produced in a seismic event. The resulting structural damage in a near-source zone is generally severe. Studies have been conducted on the earthquake damage by structural engineers from numerous state and city agencies and the Structural Engineers Association of Southern California (SEAOSC). These engineers have determined that welded steel moment frame buildings located in earthquake-damaged areas were severely impacted by the Northridge Earthquake and its aftershocks. Section 9-1-7-600 is in response to the discovery of unexpected and unprecedented damage to welded steel moment frame (WSMF) structures in the Northridge Earthquake. This serious damage was revealed only after detailed structural inspections were performed. In many cases, buildings with significant structural damage showed no outward signs of distress. Given the lack of visual and superficial clues, such as a permanent drift or damaged architectural elements, property owners and building occupants are unaware of the risk to safety and the serious consequences of hidden damage to welded steel moment frames. Inspection of the WSMF building stock in the City of Los Angeles revealed significant and widespread damage due to the Northridge Earthquake of 1994, when evaluated in accordance with SAC/FENIA guidelines. Sixty percent, or 150, of the buildings within the scope of the City of Los Angeles Repair Ordinance had significant WSMF structural damage requiring repairs. The buildings in Burbank were subjected to similar earthquake forces and ground motions as these damaged buildings in Los Angeles. A building with a damaged WSMF has little or no capacity to resist further earthquake forces. The Building Code does not allow a welded steel moment frame building to be maintained with damaged connections. It is necessary to insure that repairs to these welded steel moment frame buildings are performed in an expeditious manner. The damage to these welded steel moment frame buildings could expose occupants of these buildings to potential life-safety risks in future earthquakes, and the City of Burbank must protect its population and property and enforce the Building Code so as to provide effective protection to all its citizens. CONNECTION: Combination of joints used to transmit forces between two or more members categorized by the amount and type of force transferred (moment, shear, end reaction). NON-DESTRUCTIVE TESTING: An approved in-situ procedure for examining material continuity, including but not limited to: Liquid Dye Penetrant Test, Magnetic Particle Test, Radiographic Test, Ultrasonic Test. STRUCTURAL ENGINEER: A person authorized to use the title of structural engineer under Chapter 7 (commencing with Section 6700) of Division 3 of the Business and Professions Code. A. Structural Analysis and Inspection Report. The owner of each building within the scope of this Section 9-1-7-600 shall, upon service of an inspection order, cause a structural analysis and inspection report of the building to be prepared by a structural engineer. The structural analysis and inspection report shall contain the results of an analytical or numerical analysis of the building with the number and location of connections identified as requiring inspection based on the results of such analysis. The number and location of connections to be inspected shall be selected by the structural engineer and approved by the Building Official prior to inspection. Inspection and test procedures shall follow guidelines established by the Federal Emergency Management Agency (FEMA), Applied Technology Council (ATC), and SAC Steel Project. The Building Official shall verify the analysis and inspection procedures comply with these guidelines. The final structural analysis and inspection report shall include the result of any nondestructive tests and the results of other approved methods of testing connections, shall state whether or not the building has damage to these connections, and shall identify the damaged connections. If no repairs are indicated in the structural analysis and inspection report, the report shall demonstrate that the building’s welded steel moment frame structural elements are without damage that may reduce the moment resisting capacity of the structural elements below the building’s original minimum design requirements. If the structural analysis and inspection report indicate that the welded steel moment frame structure of the building is damaged, the report shall include plans and procedures prepared by a structural engineer for the repair of such damage. The repair plans shall indicate the repairs necessary for the structure to meet the standards for strength under which the building was originally designed. The structural analysis and inspection report must be submitted to the Building Official within 12 months after the service of an inspection order. The structural analysis inspection report is subject to approval by the Building Official. A. Column to beam connection weld discontinuities detectable by visual inspection or non-destructive testing that are not termed defects per the criteria given in the Welding Code. Weld defects resulting in discontinuity and loss of connection strength below design criteria. Cracked or damaged shear tab or weld. B. Panel zone damage such as fracture, buckle, or yield of continuity plate, yield or ductile deformation of web, full or partial depth fracture in web or doubler plate, severed column. A. The Building Official shall issue a written inspection order to the record owner of each building within the scope of this Section 9-1-7-600 and shall also mail a copy to the person, if any, occupying or otherwise in real or apparent charge and control of the building. 2. A statement that the Building Official has found the building to be within the scope of Section 9-1-7-600. 3. An order to prepare and submit to the Building Official a structural analysis and inspection report as required pursuant to Section 9-1-7-600.4. 4. A statement specifying the appeal rights of the owner as contained in Section 9-1-7-600.9. A. The Building Official shall issue a written repair order to the record owner of a damaged building directing the owner to repair any damage to the Welded Steel Moment Frame based on the structural analysis and nondestructive testing recommendations approved by the Building Official and shall mail a copy of such repair order to the person, if any, occupying or otherwise in real or apparent charge and control of the building. 3. An order to secure permits, physically commence, and to complete all work necessary to meet the repair recommendations proposed in the approved structural analysis and inspection report. 2. construction of the building began after January 17, 1994. Such appeal shall be filed within 60 calendar days from the service of the inspection order and shall clearly and concisely state the grounds for such appeal. Any materials that the appellant wishes considered by the Board shall be submitted to the Board 14 calendar days before the hearing. If no request for reconsideration and no appeal are filed within 30 days of the service of the inspection order, the building shall be considered to be within the scope of this Section 9-1-7-600.